Benefit will introduce a new fragrance, B Spot, this summer. It will be the cosmetic line's second scent (Maybe Baby launched in 2003). 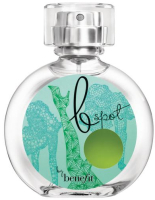 Erogenous zones are brought into play when Benefit launches its new fragrance, b spot. Aiming to awaken "seductive pulse points" the scent is a light, fruity, floral mixture of freesia, mango, blackcurrent [sic] and tangerine mixed with white orchid and amber. Additional notes include peony, apple flower, watermelon, sandalwood and marine accord. The outer packaging will include a "body map" indicating where to apply the fragrance. Sorry to be the first to point this out but after reading the ad, shouldn't this have been called “G” spot? Sorry Robin, but it was so obvious! Very funny and clever name! Yet another fruity floral, though. Blech. I'm dismayed to see that Vogue can't afford to employ literate 'writers'. Blackcurrent!! Ha! LOL — I didn't even see that. I'll add a notation, thanks! Cute play on words with the title. Horrible packaging, though. It looks like that Ashley Judd perfume I see advertised in all the gossip rags at the checkout counter, or something you could buy in Walgreen's. Maybe they spelled it blackcurrent on purpose. You know, to indicate that in perfumery, the fruity floral is the new (“current”) black……….? I sometimes like Benefit's kitschy look, but too much of it is overkill. Can't decide about this particular bottle. I'd think if Benefit spelled it that way on purpose, Vogue would have put it in quotation marks or something? Who knows. I must confess that I own a bottle of Maybe Baby and really like it, but this one sounds a bit to froooty for me. They could have done a much nicer job on the packaging too – some of their items are very cute. Hmmm, it's funny..I was wearing Maybe Baby last week and thinking it was about time they hopped back into the fragrance market with a new scent. The bottle doesn't really seem to suit…maybe it's the colours. Hopefully there is something special in the juice of this one to set it apart from all the other fruity florals flooding the market…especially since their first one was a light fruity floral! I love their makeup bags, I have a couple of them. Very kitschy & fun. This isn't quite so fun. Hi & welcome! They have taken a long time to come up with #2. Was Maybe Baby also aquatic? Given that this one seems to be an aquatic fruity floral, there is almost no way I'm going to like it. Only a second-time commenter myself! I proudly wore Maybe Baby for a stint and it is a soft slightly peach-y scent (but not fruity)…and from the bit of knowledge I have acquired while perusing this sight for about a month, I would characterize it as a “skin-scent”…would love to know if I am “spot” on from you ladies who really know what all these words mean. I will be no help because I can't remember Maybe Baby! But to me, a skin scent is something that seems to meld with your skin, e.g. what you might think of as “your smell but better”, as opposed to something that stands out as perfume. So glad you like the blog! Yes…my skin but better is kind of how I felt about MB. I guess it could just be a scent that fades down VERY quickly. Either way, I was often told “you smell good” rather than “what perfume are you wearing?” I hope you will have a go at it the next time you pass a Benefit counter. I would suspect that it would not not make a huge impression, but it is nice simple scent for those types of days. Ya, B Spot does sound like it could be aquatic now you mention it. Maybe was more apricotty/peachy fruity on me, so they will be different. I was kind of hoping though they'd come up with something deeper and huskier…I guess they didn't think their target would go for that! Hi all! I work at Benefit and while I love Maybe Baby, it's a little too sweet for me. While B Spot is marketed as “aquatic, fruity and floral”, it doesnt really give the right idea of what it smells like in reality. To satisfy your curiosity and give you a first hand insight into the real scent, I would say it reminds me slightly of Issy Mayake (sorry if i spelled that wrong, its very late at night and its been a long day of beautifying! )… its very very fresh and summery, but has just enough sandalwood and amber added to it to make it ok to wear all year round. Im not a huge fan of cosmetics brands when it comes to fragrance, but this one smells different to the rest. It smells a lot more expensive than it looks! Hope this gives you all an incentive to try it out, and remember, dont judge a fragrance by its bottle!